Sony Movie Studio Platinum - это новейшая версия очень мощной программы для создания HD-видео высокого качества с применением разных эффектов. Содержит в себе профессиональные инструменты для быстрого редактирования - присутствует теперь и модуляция, создание заголовков и специальные эффекты, включая «зеленый» экран и замедленное перемещение. Благодаря Vegas Movie Studio HD, видео-редактирование стало еще более легким и увлекательным. Одна из лучших функций — видео-редактирование в режиме реального времени с сохранением информации. Теперь не важно, какие изменения вы вносите в ваши видео и фото, оригинальные файлы сохраняются в первозданном виде. Create movies in stunning AVCHD™ and stereoscopic 3D. Edit audio in Sound Forge Audio Studio, upload movies to Pixelcast™, and burn them to DVD or Blu-ray Disc™ — all with Movie Studio Platinum Suite! With innovative and powerful features for video compositing, color correction, and animated titling, professional-grade results are easier to achieve than ever. Use the surround sound mixing tools to create 5.1 soundtracks. Add style with the NewBlueFX 3D Titling and Video Effects. Complement your film with 50 Sony Sound Series: Production Music soundtracks. When you're ready, upload completed projects to your free Pixelcast Plus* account and invite others to collaborate! Tell your story any way you want. Edit video in nearly any format, including stereoscopic 3D. Stylize your movies with high-quality video effects, transitions, titles, and filters. Fix washed-out footage or make colors pop with color-correction tools. Share your movies on Pixelcast™ without ever leaving the application! Collaborate on a fun and unique experience with friends and have them upload their movies and photos too. The choice is yours and, with Movie Studio Platinum, the possibilities are endless. Produce picture slideshows, single-movie DVDs, music compilations, and menu-based DVD and Blu-ray Disc™ projects in no time. Choose from dozens of ready-made templates or create your own custom backgrounds and buttons. You can also add a menu and scene-selection menu to any title. Sound Forge™ Audio Studio is the easiest way to work with music and sound on your home computer. Record almost anything. Give your tracks presence and sparkle. Digitize rare LP records and tapes, create your own karaoke tracks, burn CDs, and generate files for the Web and all your favorite portable players. Classic film looks in a click. Magic Bullet Quick Looks sets the mood for your footage in seconds. You can easily define the style of your video with 100+ presets that add color and light to every scene, from wedding video to the next Sundance original. The Movie Studio Platinum 12 Suite includes an exciting group of audio and video effects by NewBlue, a leading manufacturer of audio and video plug-ins. Once installed, the tools are available directly from the Movie Studio Platinum 12 effects windows, providing a seamless editing experience without ever leaving the application. These additional transitions and effects provide more options to enhance audio and video projects with a professional look and feel. 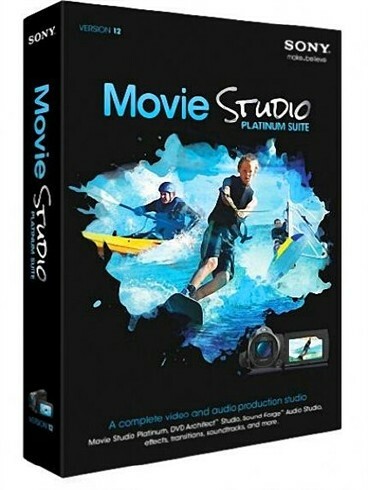 The included Jump Start Tutorials provide a quick overview of the Movie Studio Platinum 12 program. You’ll learn how to create entire audio and video projects from setup to final delivery. Topics also include several advanced sections explaining how to add that professional touch with Chroma Key techniques and Color Correction tools. Sound Forge™ Audio Studio 10 software includes the Vocal Eraser plug-in. Create karaoke tracks and remove vocals from songs for remixing. Add intensity with music. Access 50 royalty-free Sony Sound Series: Production Music soundtracks. Each Production Music soundtrack comes in four different lengths. Choose the one that best fits your movie, or tweak the file any way you want.